Some users of KESS V2/ Ktag clone feedback one same question: They got have problem with checksum when R/W only flash, take this user’s problem for example: I have problem with my ktag clone. In slave (full backup) ver read and write ok, but if i want to read only flash (ex. sid 803) or micro (ex. edc17cp14) at end of reading 99% it write checksum error and every file is different. What I can do to read and write good in master ver. 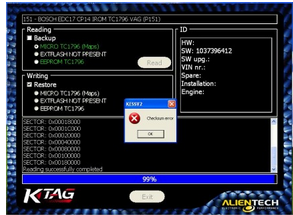 – download from alientech website Auto ECU Programmer ksiute 1.85 -> install it, it will install C++ automatically -> remove dir C:\KSiute -> Replace it with KSiute dir which You get from Your clone supplier -> restart WIN -> be happy with Your master ktag. -Some users said you must install c++ library 2005,2008, 2010.
c++2005 and net framework 2.0 then worked for my friend. Our customers feedback some problem about kess v2 at Obd2tool.com,we sovled it and have written below,if you have same problems,it will help you. How to solve KESS V2 Wake up error? KESS V2 not works with k-line or does not work well? Some users are confused what’s better among FGTECH Galletto 4 V54, KESS V2 and KTAG? 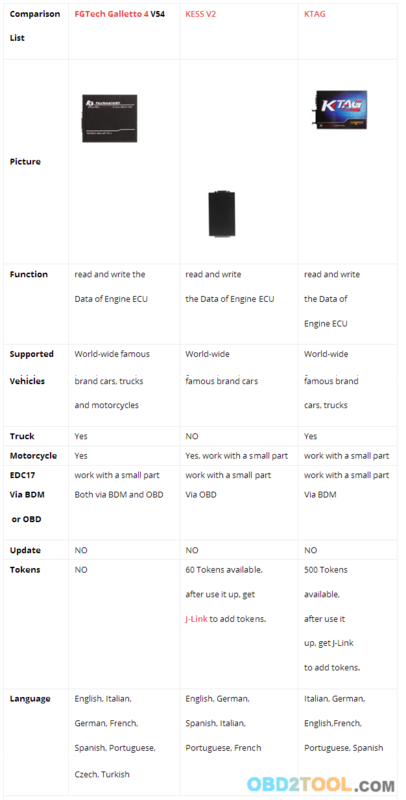 In order to help sort them out, OBD2TOOL engineer make a comparison table from the following aspects. Wish it can help you. Galletto 4 V54 and KESS V2. encrypted cars better than Fgtech V53.